No Surprises – All team members are involved understanding expectations, having open debates and sharing ideas with everyone. Cheer – The team fully supports and roots for each other, appreciating great work and encouraging the best. From the research, Gostick and Elton cite many worldly examples and they develop their case well with these examples of exceptional teamwork and results. Overall, I was pleasantly impressed reading the book, pleased to see many of the examples and activities occurring in my own workplace and I’m happy to have learned many new techniques for enhancing my own team and organization. 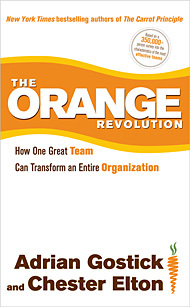 I am impressed by their writing and thoroughly enjoyed the book and I recommend it to anyone leading a team, interested in leading a team or any managers or executives with influence about the culture or teamwork occurring in their organization. For a sample of Gostick and Elton’s writing, you can see the guest post they authored here a couple months back called, Risky Business: It’s One Way to Build a Breakthrough Team. 350000 is so many people for a survey. No one is going to tell the people who did that survey that their sample size is not enough. That is more than most cities around the world have in population. I thought it was very cool that the authors of this book guest posted an article here. That is the interaction that I like to see from content-producers, and they really took the initiative there. Orange is one bright color. @Armen – Yes, it was a huge survey. I love business books based on data like this and the stats really are something to help prove the content, that is for sure. When the authors are also able to tell a story to portray their message and content for what they are teaching, it makes it a very valuable book as well. You’d like it for sure!